On Friday Evening, a 7.5 magnitude earthquake struck near the city of Palu on the island of Sulawesi. The quake and resulting tsunami killed at least 800 people and displaced more than 50,000. Tom Worthington is an Adjunct Senior Lecturer at the Research School of Computer Science, Australian National University. The Sulawesi tsunami shows the limitations of current warning technology. The system works well for predicting and detecting tsunami traveling long distances across an ocean but unfortunately not when they happen near the coast, as with the Sulawesi tsunami. It is likely there is no technological solution to this. While the dramatic elements the of initial earthquake and subsequent tsunami have caught the attention of the global media, it is the downstream events that are likely to have the greatest impact on the healthcare system on Sulawesi. By any tally, the death of 800 individuals is catastrophic, but this number is very likely to exceed 4 figures as more information becomes available. Natural disasters of this magnitude are sometimes referred to as ‘compound disasters’, whereby the infrastructure required to respond to them in a meaningful way is also destroyed. The number of injured is likely to be at least an order of magnitude greater than the number of those deceased, and yet, unaddressed, this is still not where the greatest threat to health will lie. If external aid is not urgently forthcoming, many more are likely to die from water borne disease, as all local supplies are likely to be tainted. This has implications for even the simplest of injuries- basic wounds that for us in Australia might be considered as trivial become life-threatening infections. It also has implications for basic medical care, which require sterile water. The lack of electricity again compounds the ability to power the equipment required to clear tainted water, which over time becomes a source of a second wave of mosquito and other insect borne disease. Disaster response will entail a true delineation of the extent of the numbers of casualties involved, and an inventory of the resources still left intact. Lines of communication and transport will need to be established before any on-ground medical support can be provided- despite being a ‘natural’ disaster, this remans a very hazardous environment for any responders, even if there are no subsequent aftershocks. The mobilisation of resources required to address a catastrophe of this magnitude is something at which any well-organised military excels, and given the recent expertise and high regard in which Australian responders are held, it would not be unusual for Australian resources to be requested and deployed as part of a regional response. Sadly, with the increase in severe weather events associated with our changing climate, this expertise is only likely to experience an increase in regional demand, in the coming years. At 10:02 (UTC) on 28 September 2018, a magnitude 7.5 earthquake at a shallow depth of 10km occurred 78 km north of Palu (population of 340,000) in Sulawesi (Celebes) island in Indonesia, with the epicentre being about 2km away from the coastline inland in Makassar strait. Indeed, historically the region in the vicinity of Makassar strait has been well known for large tsunamis. The earthquake appears to be within the Molucca sea tectonic plate and near the colliding boundaries of Molucca sea and Banda Sea micro tectonic plates. Near the location of this earthquake, the Sunda and Molucca sea plates are converging at a rate of approximately 30 mm/yr. Due to this severe shallow earthquake, peak ground acceleration in the range of 0.40g and peak ground velocity of 40 cm/s are expected. Overall, moderate/heavy damage level is expected, while significant dead toll and injuries are expected to be due to tsunami in Palu and Dongala cities. It is evident that lack of active tsunami early warning system impacted the dead toll in Palu and Dongala. Indeed, while the tsunami approaching the shorelines, no evacuation siren was active and traffic was passing the road near the ocean, even seconds before the tsunami swept away roads and buildings. People were still in the mosque meters away from the shoreline when the tsunami hit Palu. It is expected that the dead toll increases and to be in the order of thousands considering the combined impact of tsunami and inland earthquake. Despite it is not usually expected that strike-slip earthquakes with the inland epicentre induce large tsunamis, this case highlights that topography of the ocean floor including presence of localised submarine ridges and slopes, and ocean trenches can induce large tsunamis. Indeed, when two tectonic plates slide past each other and the rupturing extends offshore, any large obstacle or cavity can displace large body of water up or down inducing huge tsunamis. In this case, the height of the tsunami very much depends on the size of the submarine obstruction or trench as well as the rate of fault rupture; the larger the obstacle, the higher the tsunami. Therefore, it is technically possible to induce large tsunamis when the strike-slip fault rupture occurs with epicentre being inland but near the ocean; so the fault rupture extends from the land into the ocean floor. The length of fault rupture in Palu Earthquake is estimated to be +75 km and considering the fact that the epicentre was only about 2km away from the shoreline, it is expected that significant portion of the fault rupture was extended into the ocean floor in the Makassar Strait. Initial field observations show that several emergency departments such as hospitals, mass gathering places such as mosques and critical infrastructure such as bridges and major roads were significantly damaged and collapsed, which made the evacuation as well as rescue efforts extremely difficult if not impossible. Indeed, if these buildings and infrastructure were designed following the most recent seismic design and construction codes, they could survive this earthquake with minor damage. Assessment of damaged buildings and structures shows that mainly multi-storey low-rise buildings (1-5 storey) such as shopping centre, hospital, mosque, and buildings with slender columns and without cross bracing have been damaged severely in Palu city. Some of the collapsed buildings were reinforced concrete buildings with slender columns not capable of resisting such strong earthquake. It is expected that the earthquake and tsunami induce ground subsidence in the order on 1m in the coastal towns in Sulawesi exacerbating the seismic damages. In specific, the most severe land subsidence would be expected in the west shoreline of Sulawesi in Makassar Strait. Land inundation and subsidence can significantly damage utility systems and pipelines for drinking water, sewage, and gas in Palu, Dongala and Poso cities. Indeed, lifelines damage hamper emergency response and immediate rescue efforts. It should be highlighted that ground inundation and subsidence can make the foundations of buildings extremely weak, and structures may collapse due to foundation failure during aftershocks. People should stay away from inundated buildings and where the ground has already subsided. The 7.5 magnitude earthquake that hit Sulawesi occurred on one of a series of large strike-slip faults that cut the island. The main fault, the Palu-Koro fault, has very clear topographic expression, forming a deep, narrow valley. Where that valley meets the coat, it forms the narrow bay that focused and accentuated the tsunami. The sift sediment that infills the valley and the bay may also have accentuated the shaking from the earthquake. It is unusual for a strike-slip fault to cause such a large tsunami as the motion is horizontal, rather than vertical, and thus is less likely to create the uplift of the seabed that created the tsunami wave. Although it is too soon to confirm, the tsunami may instead have been generated by submarine landslides which are a result of the bathymetry created by the fault offshore. Aftershocks are likely to continue for some time, with the risk that further collapse of already weakened buildings may occur, as well as landslides onshore associated with the steep slopes that define the topography of the area. The earthquake impact could not have been much worse, Palu and Donggala are on the Palu fault that ruptured. Shaking would have been strong and lasted tens of seconds. Buildings obviously were not constructed according to the Indonesian Earthquake Code, many collapsed killing their inhabitants. The tsunami was quite unexpected given the focal mechanism was strike-slip but can be explained because of the displacement of a steep 2km deep side of the trench into the Makassar Strait. This is a fairly unique bathymetry. No doubt the long narrow gulf off the strait contributed to the tsunami runup at Palu. Two major earthquakes occurred on the Palu Fault forming this part of the plate boundary in the last 80 years, the last in 1996, so it is surprising that people waited for a warning instead of seeking out higher ground immediately they felt strong shaking. A tsunami warning was issued from Singapore and cancelled more than 30 minutes later. It predicted a tsunami of 0.5 to 3m and the failure of a close gauge would not have influenced the outcome - any warning would have been too late. The source of the tsunami was very close to the affected region, leaving very little time for an effective warning even under ideal conditions. The coastal population needs to be told that if the shaking lasts more than 20 seconds, they should evacuate to higher ground without waiting for a warning - the shaking is the warning. The earthquake had a strike-slip mechanism involving mainly horizontal movement of the ground, not the vertical movement that produces tsunamis. Although no evidence exists at present, the tsunami may have been caused in part by underwater landslides triggered by the earthquake. International experts said that while Indonesia's warning system might be improved, its geographic position and the nature of the disaster made tsunamis almost impossible to defend against. First we need to realize that each tsunami is unique and therefore very difficult to predict particularly where there are not long periods between the earthquake and tsunami. The epicenter of the earthquake was on land, so had a very low probability of generating a tsunami, suggesting that it may have been triggered not by the earthquake itself but by a submarine landslide. 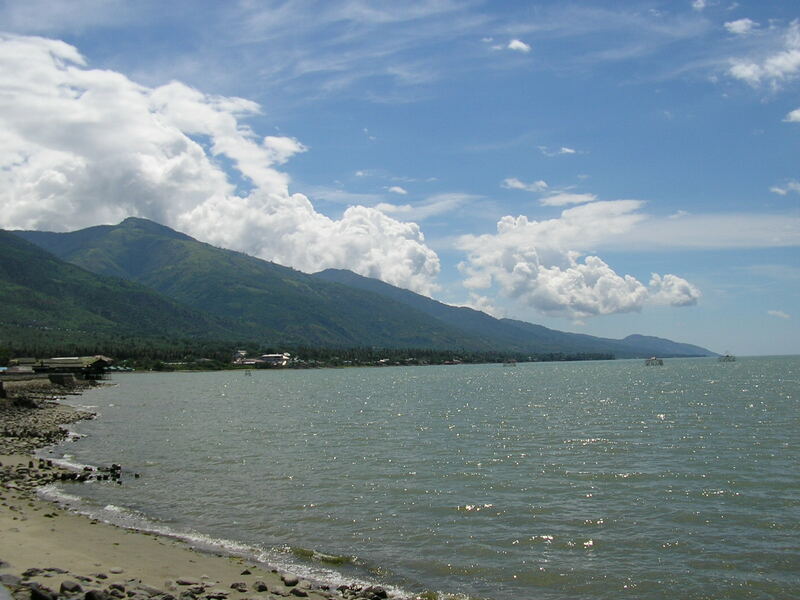 Palu, the largest city to be hit by the tsunami, is located at head of a long narrow bay, measuring around 30-40 km in length. As the tsunami traveled up this bay it would have become highly amplified. I have just returned from Vanuatu where we have been testing a new low-cost tsunami early warning technology, and thus the current tragic events in Indonesia are of tremendous interest, as we seek to create systems to reduce the harm they cause in future events. One of the great challenges surrounding the Sulawesi earthquakes and tsunami is communications: The initial tsunami warning could not be distributed because of the damage to cellular communications systems. Similarly, the officer who made the call to cancel the tsunami warning after 36 minutes was not able to communicate with colleagues, and may not have been able to receive all relevant data when forced to make the decision. Our recent work in the Pacific Rim of Fire, where Indonesia sits has been on trialling a new approach to make tsunami early warning systems that do not depend on any ground-based communications, and are simultaneously cost only 1% of conventional tsunami warning towers. This is important, because the traditional approach of installing large siren towers is too expensive to cover the entire region, and thus we find that the majority of the communities in the path of these kinds of disasters may lack the means to receive a tsunami or other warning. A satellite transmitter based at Flinders University sends the warnings to a geostationary satellite. Operating the transmitter from the University helps to keep costs low. The satellite then broadcasts a signal that covers a large area of the region. With a second satellite signal, the entire Pacific Rim of Fire could be covered. Using innovative very small and very low-cost receivers built into a small portable warning system, alerts for tsunami and other risks can be received in as little as 11 seconds. The warning system contains a siren. The whole receiver costs only a couple of hundred dollars, making it the first practical solution for providing every vulnerable community -- no matter how small -- with tsunami and other hazard warnings in real-time. The system also includes a small FM radio transmitter, that creates a "village radio station" with content fed via the satellite signal. Residents use their ordinary FM radio, or mobile phone with FM receiver, to receive much more detailed information about the alert. The FM radio station operates year-round, providing news, weather, entertainment, climate change mitigation information and government notices, so that it is useful every day of the year. This is vital, so that the system will be maintained by the recipient communities, so that it will work when required. This addresses a major problem with typical warning systems, where they are often not maintained between disasters, because of the competing time and cost pressures on communities, together with the lack of perceived value when people aren't thinking about disasters. The total cost of operating the system is fixed, regardless of the number of receivers, which makes it uniquely scalable, especially when combined with the very low cost of the warning system hardware. The work in Vanuatu has established that this system can work, and our goal now is to continue this work to create an operational system that can be piloted and rolled-out as rapidly as possible. We are currently looking at ways to fund the next stage of the project, so that it can be ready for the next time it is needed. We have video and images of our recent activity in Vanuatu, and are willing to provide interviews and other support to media outlets who wish to run this story. The earthquake seems to have occurred primarily along a previously recognized fault system; the Palu-Koro fault system, which is a major active left-lateral strike-slip fault zone on the island of Sulawesi in Indonesia. Prior geological and geodetic studies of the fault zone suggests a strike-slip rate of approximately 3-4 centimetres per year, and that at least three major earthquakes occurred in the last 2000 years, with an average recurrence interval of about 700 years. By global standards, this is a highly tectonically active fault. It seems that this fault was probably late in its seismic cycle, meaning an earthquake with the location and magnitude experienced on October 28 was certainly not unexpected. The distributed nature of the fault and young sedimentary materials in the Palu area means that past earthquake surface ruptures could have also have been obscured and/or buried. The source of the tsunami could relate to jogs and step-overs in the strike-slip fault zone, which might have increased the amounts of vertical motion that could displace seawater, or the lateral movement of seafloor at steep bathymetric undulations (like marine shelves) that push seawater laterally and vertically. Strong shaking in the earthquake may have caused an undersea landslide that would have displaced seawater and caused the tsunami. More studies of the earthquake and seafloor will be required to further improve our understanding. The liquefaction that occurred in Palu is not surprising given the strong shaking and nature of the geological materials. Much has been made of the ineffectiveness of Indonesia’s seismometer-and-tidal gauge-based tsunami alarm system; in reality a warning of wave heights of 0.5 to 3m had been issued 5 minutes after the earthquake, and the first tsunami wave arrived only 8 minutes after the earthquake; it is unclear at this stage how operational capacity for the marine-based network might have resulted in a better outcome from a fatality reduction point-of-view.